A second company has accused plaintiff lawyers of using fraudulent tactics to win asbestos lawsuits, citing evidence uncovered after a federal judge opened records obtained in the bankruptcy of Garlock Sealing Technologies. John Crane Inc., which like Garlock made industrial gaskets containing asbestos fibers, has asked a judge to allow it to join Garlock’s racketeering case against the Simon Greenstone law firm in Dallas and the Shein Law Center in Philadelphia. Any doubt about the end of supposed independence of the World Health Organisation was dispelled at the latest UN workshop on chrysotile. Rather than the respected forum for careful consideration and scientific rigour of the past, the organisation’s apparatchiks have, sadly, succeeded in turning it into an international lobbying group who are now a law unto themselves. Descending on Geneva at the end of March, the WHO, launched its latest, barely disguised, attempt to brow beat countries that use chrysotile into submission. Launching an outright dismissal of the approach ordered by their political masters on the World Health Assembly (WHA) – to distinguish between chrysotile and other more dangerous forms of asbestos – the WHO introduced new – taxpayer funded -ways to call for a worldwide ban on the substance. Maria Neira is an international civil servant. She is supposed to work for you and me. As a leading figure at the World Health Organisation (WHO), her role is to implement decisions taken by international governments. And yet Dr Neira, head of the WHO’s public health and environment department, seems to think she knows better than the democratically elected officials. On the issue of asbestos Dr Neira seems to believe she has the right to ignore carefully thought through policies thrashed out by health ministers from global governments at the World Health Assembly (WHA), which directs the WHO’s work. Those elected officials, after much careful deliberation, decided that the best way to eliminate the terrible blight of asbestos related diseases was “a differentiated approach to regulating its various forms – in line with the relevant international legal instruments and the latest evidence for effective interventions”. With much care, they acknowledged, that dealing with asbestos-related disease needed to reflect the different forms of asbestos; on the one hand, deadly blue and brown amphiboles, and on the other, white chrysotile, which is safely used in the majority of countries around the world. But despite this careful reflection and well thought through orders, Dr Neira has decided she knows better – mirroring the clarion call of lobbyists and lawyers making millions from asbestos lawsuits – even going so far as to post her views on YouTube, she is backing a global ban on asbestos, including chysotile. But what about the WHA’s order to take a “differentiated approach”? According to Dr Neira, “there is a sentence that says ‘with a differentiated approach’ but this is related to the legal instruments you want to use at country level, but it is certainly not referring to any differentiated forms of asbestos. For us, all forms of asbestos including obviously chrysotile are carcinogenic”. Really? So what did the WHA – “the supreme body for our policy recommendations”, as she calls it – mean when it referred to “various forms”? Apparently, she, like her friends in the asbestos ban lobby, has simply chosen to ignore what the WHA clearly acknowledged, that there are different sorts of asbestos and the risks associated with them are also different. So she has evidence that chrysotile, as well as blue and brown asbestos, is responsible for the spread of disease? So what is going on? The participants at the WHA specifically inserted the language about a differentiated approach to reflect the fact there are different types of asbestos and different risks associated with them. But Dr Neira, has unilaterally chosen to completely ignore this, directly contradicting the orders of the WHA, the “supreme body”, as she calls it. How has this happened? How has a legitimate health issue, the very toxic affects of amphiboles, morphed into an ugly business filled with fraud and undue pressure on developing countries? The WHO, led by Dr Neira, seems to have been completely taken in and is deliberately misinterpreting its mandate. It is ignoring its democratically elected leadership – and enacting a set of policies that are odds with formal and official policy. Has the WHO gone rogue? Is it in the pocket of the powerful anti-asbestos lobby – fuelled and funded by those who make millions from lawsuits or by supplying substitutes? Dr Neira would appear to have many questions to answer. “We know as well that there is an estimation of more than 100,000 deaths that can be attributable to exposure to asbestos, all types of asbestos,” says the WHO’s Dr Maria Neira. “Each year around 107,000 people die from asbestos related cancers, mesothelioma and asbestosis (fibrosis of the lung) as a result of exposure to asbestos,” says leading anti-asbestos lobbyist Karen Kazan Allen. “There are 107,000 asbestos-related deaths worldwide every year,” says attorney Steven Kazan, the brother of Karen Kazan Allen, who has earned millions of dollars from asbestos-related lawsuits. The frightening death toll is cited as “evidence” of the need for a total ban on all forms of asbestos. House Speaker John Boehner says asbestos legal reform is a priority in the New Year, and it can’t come soon enough. Based on the details emerging from federal bankruptcy court, asbestos litigation fraud has reached new heights. Garlock Sealing Technologies is a maker of gaskets that since its bankruptcy in 2010 has become a symbol of the corrupt practices of the plaintiffs bar. Lawyers demanded $1.3 billion in payouts from Garlock for mesothelioma patients until federal Judge George Hodges reviewed evidence showing that many of the claims were a sham. The judge in January slashed the company’s liability to $125 million and slammed the trial bar for «misrepresenting» the facts. Then in October he moved to unseal that evidence, and now we’re getting a glimpse of what has become a widespread tort-bar con. Court documents show the ugly specifics of «double-dipping» — in which lawyers sue a company and claim its products caused their clients’ disease, even as they file claims with asbestos trusts blaming other products for the harm. This lets them get double or multiple payouts for a single illness, with a huge cut for the lawyers each time. When it comes to the selective use of scientific data to come up with unscientific policies, Europe is a world leader. A growing danger for the global economy is that the EU is trying to get the world to follow its lead on important regulatory matters. The latest case concerns asbestos. 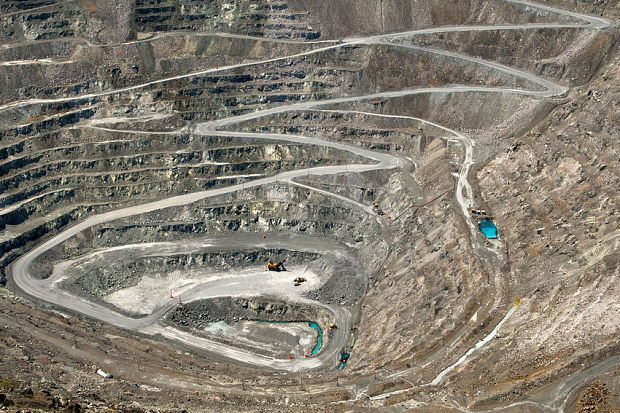 Amphibole asbestos, one of the two broad types of the naturally occurring substance, has been generally regarded as a carcinogen and widely banned for three decades now. But only the European Union and a dozen or so other countries have banned the other type of asbestos, chrysotile. Also known as white asbestos,chrysotile remains a $600 million-a-year industry that thrives especially in Russia, China, Canada and Brazil. That could change soon. At a five-day conference beginning tomorrow in Lyon, the U.N.’s International Agency for Research on Cancer (IARC) will review a study of various synthetic chrysotile substitutes to determine whether they are safer than the real thing. In making such a comparison, one might expect the new information on the synthetics to be weighed alongside the most up-to-date data available on chrysotile itself. Yet under IARC’s mandate for the study, handed down by the World Health Organization, no new analysis of chrysotile was ordered. What is really happening in Thailand? A self-appointed cavalry rode into Thailand recently. Greeted by loyal local acolytes and feted by the media – the global champions of the international ban asbestos lobby camped out in a 4-star hotel in Bangkok. People like Dr Barry Castleman who a senior US judge labeled “unreliable” and his evidence “inflammatory” and “hearsay”. Dr Ken Takahashi who appears confused, and perhaps conflicted, on whether he is an anti-asbestos activist from the Global Ban Asbestos Network (GBAN) or a director at the supposedly independent World Health Organisation. The pair have been racking up the air miles alongside fellow frequent fliers like Asian Ban Network “General” Sugio Furuya. These modern crusaders descended on the Thai capital en masse to – they hoped – herald in the prohibition of chrysotile cement. For 70 years chrysotile has provided Thailand with a cheap and durable material to build high quality, low cost housing – tried and tested products to protect homes and buildings from the country’s heat, humidity and heavy rains. But this highly motivated lobby talks darkly about the danger posed by chrysotile, and is urging Thailand, its government and its people to act “before it is too late” – whatever the cost. Chrysotile is asbestos, they say, and all forms of asbestos are carcinogenic and therefore must be banned (although so are wood shavings, salted fish and silica – but there are no calls for a prohibition on these!). 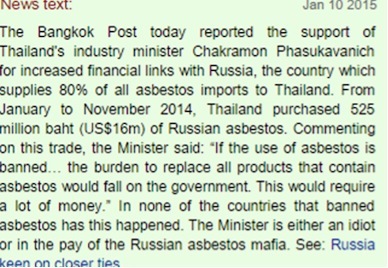 These scaremongers point to health crisis in other parts of the world, places where different, more dangerous, forms of asbestos were widely used without regulation, and claim that it is only a matter of time before Thais start dying. But in Thailand, this same well-funded group cannot point to a single case of someone who has developed cancer or illness because they lived under a chrysotile roof, drank from a chrysotile water pipe or worked in a factory that uses chrysotile. asbestos deaths and that 70-years is too short a timeframe for the problem to surface. They deliberately ignore the fact that the unarguably serious health problems elsewhere are caused by other forms of asbestos, amphiboles, like blue and brown asbestos, which are highly dangerous. And fail to acknowledge that chrysotile is a vastly different material, which, when encased in cement, is proven to be safe, and that the Thai experience only goes to underline this. With perfect timing, the ban lobbyists took up residence in Bangkok just as their wealthy friends at local conglomerate, The Siam Cement Group (SCG), turned the screw on their buddies in the government to back a ban on chrysotile. Once one of leading chrysotile cement product suppliers in Thailand, SCG gambled on other more expensive and less effective alternatives — losing it money and market share. Now, with the noisy lobby for company SCG hopes the new rulers will ban its competitors’ products – probably forcing them into bankruptcy — and simply hand the firm a countrywide monopoly. As so often before championed by the BBC, it warned us again of the deadly dangers posed by asbestos — this time in Britain’s schools. In the past 30 years, it was claimed on Radio 4’s Today programme, 178 teachers have died of asbestos-related diseases — and their numbers are rising all the time. Steps must be taken to protect pupils and teachers from asbestos in schools, a new study has warned. Six weeks ago, I wrote a column about a ridiculous lawsuit being brought by Carolyn McCarthy, a congresswoman from Long Island. A smoker for most of her life, McCarthy has lung cancer. Yet her lawyers claimed that it was her “exposure” to asbestos, through the work clothes of her father and brother, both boilermakers, that triggered her cancer. Though McCarthy certainly deserves our sympathy as she fights cancer, it is hard to see her lawsuit as anything but an undeserved money grab — and the latest twist in asbestos litigation, the longest running tort in American history, with no end in sight. Then again, maybe there is finally an end in sight. Late Friday afternoon, Judge George Hodges, a federal bankruptcy judge in North Carolina, wrote a breathtaking decision, in which he essentially pulled the lid off another form of asbestos scam. Though he shrank from labeling the actions of the plaintiffs’ lawyers involved in asbestos litigation as “fraudulent,” he did describe the litigation as “infected with the impropriety of some law firms.” It’s a potential game-changer. Q&A: What’s the Asbestos Risk Today? Three decades after Manville Corp. collapsed under an avalanche of asbestos litigation, personal-injury claims continue to pile up at a rate of 85 per day. They find their way to a small office building in suburban Virginia, where processors evaluate the paperwork of pipe fitters and welders and shipbuilders who say they contracted debilitating lung diseases from the company’s insulation products. By last March, a Manville bankruptcy trust had already paid out nearly $4.3 billion. So when a beneficiary of one David E. Knight came to the trust saying the former seaman had succumbed to the deadly cancer mesothelioma, the administrators didn’t blink. Within five weeks, the claimant received a check for $26,250. Fraudulent claims for asbestos exposure are shortchanging companies and legitimate victims, former judge and McCarter & English attorney Peggy L. Ableman testified today in support of legislation aimed at curtailing false claims on an estimated $30 billion in assets. Under the current system, people claiming harm from asbestos can seek damages from trusts set up by bankrupt companies and simultaneously sue non-bankrupt companies, using inconsistent information about how and when they were exposed, Ableman said in a hearing before the U.S. House of Representatives Subcommittee on Regulatory Reform, Commercial and Antitrust Law today. Companies are “often led to believe — erroneously — that their products were far more responsible for the plaintiff’s disease than what may have been the case, because they have no way of knowing the substance of an individual plaintiff’s claims,” Ableman said. EDWARDSVILLE, Ill. (Legal Newsline) – A recent ruling by a bankruptcy judge that exposed “double dipping” has an attorney in the nation’s asbestos litigation epicenter calling for more transparency between the two systems set up to compensate people sickened by asbestos. Huelsmann was reacting to a decision out of the Western District of North Carolina, in which U.S. District Judge George Hodges found a “startling pattern of misrepresentation” by plaintiffs’ attorneys in manipulating evidence of exposure as it pursued Garlock Sealing Technologies, first in court and then in bankruptcy proceedings. Plaintiffs wanted to settle Garlock’s liability in bankruptcy for up to $1.3 billion; Garlock valued its liability at $125 million. Hodges found Garlock’s figure to be a reliable estimation. DOVER, Del. (Legal Newsline) – The Delaware Supreme Court has found in favor of a talc manufacturer in an asbestos case, concluding that the lower court erred when it failed to grant a new trial after witnesses made derogatory statements during testimony. Justice Henry duPont Ridgely delivered the July 24 opinion with justices Leo E. Strine and Randy J. Holland concurring. Ridgely concluded that defendant RT Vanderbilt Company Inc. should have been granted a new trial and reversed the Superior Court’s judgment. Vanderbilt appealed after a jury in the lower court found the defendant 100 percent liable and entered a verdict in favor of plaintiff Darcel Galliher, individually and on behalf of the estate of Michael Galliher, awarding her $2,864,583 plus interest. The Government’s chief scientific adviser, Prof Sir John Beddington, has given the green light to the white asbestos scam, says Christopher Booker. Attorney Steven Kazan whose Californian law firm earned $13 million last year — much of it from asbestos claims — has been using some of his hard won litigation fees to fund President Barack Obama. Obama has rejected calls for greater regulation of the asbestos claims industry, and over the last few years Kazan, and his wife Judy, have thanked the President with political donations. Mr and Mrs Kazan have sent more than US $700,000 to boost local and national Democrats, both from the offices of his burgeoning law firm, and from their charming Piedmont Italian-style villa (see picture). Mr Kazan and his sister, Laurie Kazan-Allen, who runs London-based pressure group the International Ban Asbestos Secretariat (IBAS), have done more than anyone to keep the money coming in for the asbestos claim industry.